This was a great evening. At one point Jody brought oil, feeling we should anoint Peter - so that's exactly what we did. Rachael decribed a vision of a long, long trestle table in what appeared to be a mediaeval castle hall. The table had an almost completed jigsaw laid out along its entire length. The jigsaw was composed of many scenes from life, and each scene contained something of Jesus. At a time of particular difficulty there was a beam of light or a glass containing the water of life, and in a scene when all was well there was a little bird sitting in a tree or some other little, joyful feature. The long jigsaw represented a person's lifetime, from birth to death. 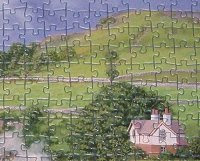 At the end, the man making the jigsaw had only a few pieces left to add. Chris saw that there were many tables and they all centred on Jesus and each long jigsaw was actually joined into him. So the place where the jigsaw ended, the point of death, was also the place where it joined with the centre and in reality connected fully with Christ. We reflected on these pictures and considered again how we are grafted into the one true vine (John 15). We really are a royal priesthood!